The welding industry contributes more than $5 billion to the Canadian economy and employs over 300,000 individuals. Become a part of this booming field, and learn welding techniques and skills to ensure you’re fully prepared for the trade. In this program you will become skilled in multiple welding processes with additional learning in blueprint reading and metal fitting. You will also become familiar with metals and their unique properties, and enhance your hand-eye skills to work safely and effectively in the structural, pressure vessel and manufacturing industries. Whether you are preparing to build, create or repair, you will have the attention to detail and technical knowledge for a successful career in this high-demand skilled trade. Additional features of this program include a ‘block programming’ delivery that allows students to complete their in-class hours in one of two sections either from Monday to Wednesday or Thursday to Saturday, and a welding capstone project in the fourth semester that challenges students to research, design, build and present a final project to their abilities and prepare them for the workplace. This two-year program will provide students with exceptional welding skills sought by employers in the structural, pressure vessel and manufacturing industries. Students will learn from professors with vast welding experience to receive expert knowledge and practical skills that will foster their trade. This program will teach students to create and read blueprints; give them the skills of fitting metals and understanding their characteristics; equip them to work safely in the industry; and give them practical experience in weld shop and inspection methods. During the second year of this program students will manage a capstone project that will test the skills and knowledge they have learned, preparing them for a successful transition to the workplace. This program provides an opportunity to introduce students to a field where employment opportunities are abundant, and also train them to meet the growing demands of the welding field. 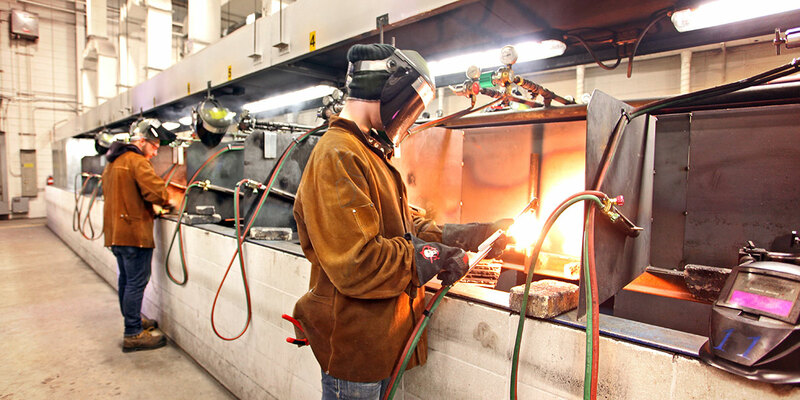 Students will learn traditional forms of welding such as gas metal arc welding (GMAW), flux cored arc welding (FCAW), shielded metal arc welding (SMAW), and gas tungsten arc welding (GTAW), as well as Plasma cutting and Air Arc gouging. Graduates will be prepared to work in the manufacturing and construction sectors with the skills and knowledge to find entry level employment opportunities in a number of areas such as welding shops, manufacturers of metal products, piping and structural contractors, automotive and aircraft manufacturers, repair and maintenance services, building and construction industries, railroad and railcar industries and wind turbine manufacturers. Perform safe work practices in the welding trade in accordance with the Occupational Health and Safety Act (OHSA) and Regulations for Industrial Establishments. Prepare and interpret drawings that would typically be used in a manufacturing and/or fabricating environment. Perform all positions in shielded metal arc welding, gas metal arc welding, flux core arc welding, gas tungsten arc welding utilizing mild steel and structural shapes with various consumables as well as open root welding on plate and pipe in all positions using the SMAW process. Identify the applicable code(s) or standards to be used in conjunction with each specific fabrication activity. Learn to use fitting skills to control distortion and correction techniques as they apply to expansion and contraction forces. Students in the Welding Engineering Technician Diploma program will be invited to apply to the co-op option during their first academic semester. Entrance to the co-op option is limited and the processes for securing a work term are competitive. Students who qualify for co-op will be eligible to complete a four-month, paid work term between the second and third semesters of their program. The co-op work term will provide students with work experience in the welding industry. The co-op work term expands students’ learning environment to real work settings where they will be challenged to apply their academic knowledge and practical skills and then return to campus with a deepened understanding of industry demands and required skills.